In 2009 Australian Stewart Scott became the first Australian player to win the Aussie Millions main event. The run of Aussie champions at the Crown Casino in Melbourne, Australia has now been increased to a second year. Tyron Krost (pictured left), a resident of Sydney, topped a field of 746 players today at the final table of the $10,000 AUD no-limit hold’em main event to take home the impressive top prize worth $2 million. Play began slowly between the final eight, and the first elimination did not take place until three hours of play had transpired. With 400,000 in the pot and a flop of 8 5 3 sitting on the table, Stephen Shelly checked, and Tyron Krost bet 325,000. Shelly check-raised all in and Krost made the call. Krost showed down pocket jacks and Shelly held pocket sevens. The turn and river delivered blanks and Shelly was eliminated in eighth place ($125,000). 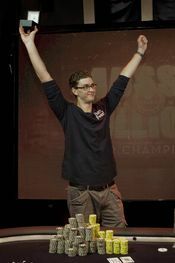 A few minutes later another player hit the rail and this time it was one of the biggest names left in the tournament. Obrestad was eliminated on the hand in seventh place ($175,000) and thanks to two knockouts in a row Krost’s stack now stood at 3 million. The final six players then went to dinner and Mizzi still paced the field with a chip lead worth 4,975,000. The pocket tens held for Krost and Jetten hit the rail, leaving four final players. Mizzi was the only professional left at that point and he took a big hit when his A 5 was dominated preflop by the A K of Frederik Jensen. Jensen was all in and he doubled up to 5.5 million after his A-K held on a 9-7-3-Q-3 board. Mizzi was left with just 950,000 after the hand with the blinds at 40,000-80,000 with a 10,000 ante. Mizzi continued to battle on a short stack but it was a volatile ride for the young pro and he eventually fell in third place. Varoxis beat him to the rail though. He moved all in on a flop of Q 9 7 with A-6 in the hole and Jensen had him covered with pocket twos in the hole. The turn brought the 10d and the river fell 2 to give Jensen trips. Varoxis took home $450,000 for his fourth-place finish and then Mizzi busted in third place a short time later. Krost won the hand and the tournament with a pair of kings up and a nine kicker, and Jensen was eliminated in second place ($1.1 million). Krost was awarded the $2 million top prize and for the second year in a row an Aussie won the Aussie Millions main event. NOTE: All payouts are in Australian dollars (AUD).